The diamond, with its classic and enduring beauty, is prized for its shimmer and clarity. In this vein, the diamond birthstone for April is said to provide the wearer with clear-headedness and emotional balance. As the diamond is the hardest and strongest of all gems, for those who adorn themselves with diamonds they can expect an increase in inner strength and perseverance. Those born in April are said to display courage, ambition, loyalty and honesty, therefore the diamond is the perfect gemstone for April birthdays as it epitomizes those lofty traits. Those born under the sign of Aires would be wise to adorn themselves with a bloodstone charm. 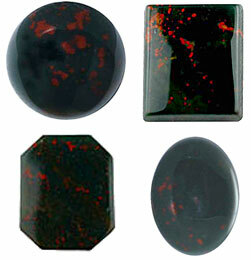 Bloodstones are known to protect the wearer against the harms of an evil eye and are symbolic of justice. Traditionally Bloodstones have been used for healing to body and spirit as it both improves circulation and removes spiritual blockages. For Aires, known for their drive in leadership, justice and healing, the Bloodstone encapsulates the essence of their personality and wearing it as an amulet will evoke their inner passions and aid them in their noble pursuits. Emblem of innocence is known."